Van life has had it’s challenges; they have been more than plentiful lately. I have spent too many nights in tears, overwhelmed with some obstacle, either real or perceived. This is hard. It’s counter-cultural. Do you do things that go against the norm; against what’s socially acceptable and socially desirable? We tend to shy away from anything uncomfortable, inconvenient, and weird. Here’s a story for you – a story of stereotyping and judging. On Friday, Dan and I were happily driving our home (full of ski gear) to the ferry to go to the mainland for a backcountry ski trip. I was sitting in the back, and noticed a police car with sirens beside us. I warned Dan, and sure enough the officer switched lanes and pulled in beside us. We pull over, and I silently curse under my breath as I realize I don’t have my seatbelt on. There’s no way they could tell, but still, I’ll get dinged for that for sure. The officers (yup, they needed 2 to harass these hippies) walk up to Dan’s window and begin with, “Have you been smoking pot or drinking?” “No…” Dan says, rather taken aback by the accusatory question. Officer #2 proceeds to shine his light at me in the back seat. “No, I’m not wearing one,” I offer my confession. Hmm. Right. His eyes are red. As if the officer could see the “red” eyes of my completely sober husband as he drove ahead of them. The officers leave us, and Dan and I discuss how I’ll get a ticket for no seat belt, and that will be the end of this mess. We feel frustrated though – that the officers had no reason to pull us over, other than to check if we had been smoking pot – it feels incredibly discriminatory. They come back and hand me the ticket. Fair enough – I did break the law, but still not a just reason to pull us over, but whatever. Then (and this continues to blow my mind! ), the officer tells Dan that he has just cause to do a breathalyzer test on him. Why? Because he has RED EYES. Doesn’t smell like booze. Doesn’t smell like pot. Hasn’t been driving as if under the influence. RED EYES. We felt violated. This is our home (which cannot be searched without a warrant) and there was no reasonable reason for them to pull us over. They saw a vanagon, and decided to see if there was any shenanigans they could break-up. 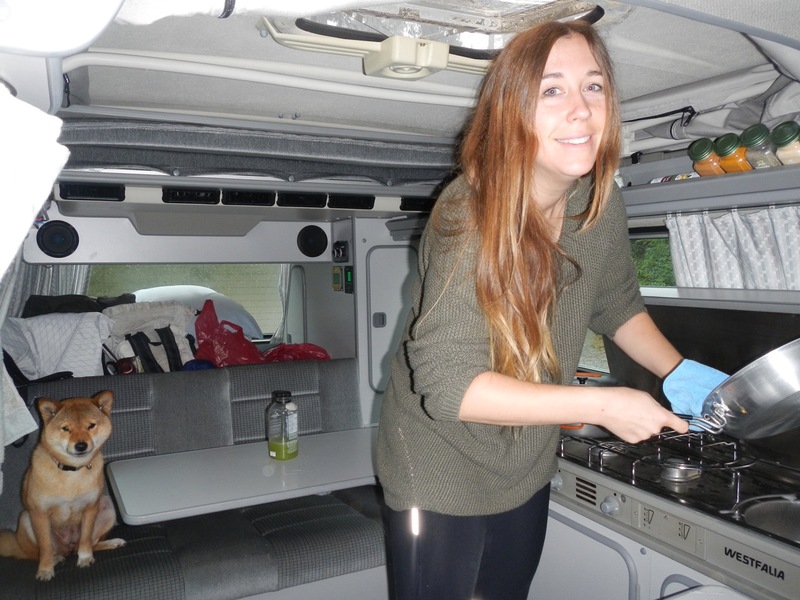 I’m only sharing this because I want this blog to share the struggles and challenges of van life, along with the countless blessings and advantages. Why the stigmas? Why the assumptions? Why (quite frankly) the harassment? I knew this time would come – where I would feel criminal and ashamed of the life choice I’ve made. That this is a “scummy” thing to do. That there must be something shady about me if I chose to live in a van. Think before you judge. Be open to people that are different from you. Learn from one another. Admire people who are “different” – for they “shake things up” and may be paving the way to the new normal. Don’t fill in the blanks – that at homeless man is an alcoholic, or that a van-dweller habitually smokes pot. Sure, stereotypes often stem from some loose statistical assumptions, but there are always exceptions. Assume the exception, unless proven otherwise. Sending my love, and hugs.